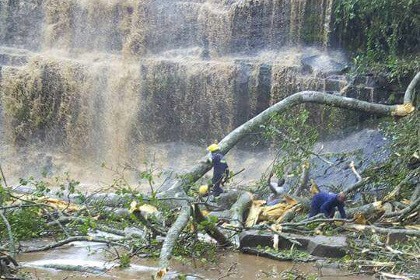 Twenty students died after trees fell on them while swimming in a river during a freak storm in Ghana, emergency officials said Sunday. Ghana National Fire Service spokesman Prince Billy Anaglate said the "unusual incident" happened on Sunday afternoon, when a group of high school students were swimming at the Kintampo waterfalls, a popular tourist destination in the Brong-Ahafo region. Anaglate told AFP that a brewing storm caused trees to topple and fall on the teenagers while they were in the water. "They were swimming in the river when there was a storm, a windy atmosphere that had uprooted some of the trees and they had fallen on some of them - those who were apparently swimming," Anaglate said. 18 students died at the scene while two others died in hospital, Anaglate said, adding that 11 more were receiving treatment, including one of the school administrators in charge of the trip. "We extend our condolences to the families of the dead and pray for the injured," said the country's tourism minister Catherine Abelema Afeku in a statement. Accidents ranging from deaths caused by mass flooding to petrol tanker explosions happen sporadically in Ghana because of lax regulations and disregard for rules.